« Has customer empowerment killed CRM? 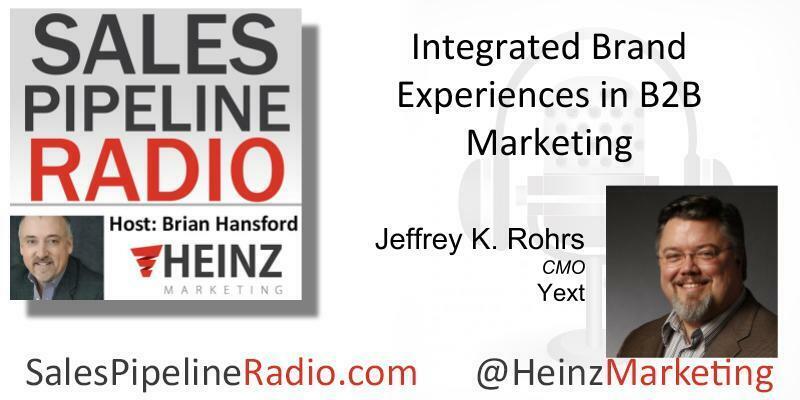 Brian Hansford, VP of Performance Management at Heinz Marketing hosted our guest, Jeffery K. Rohrs, CMO at Yext. Read the full transcript about Integrate Brand Experiences in B2B Marketing on our blog starting Mon. 6/25/18. I serve as our Global Chief Marketing Officer and we are the leading digital knowledge management platform with a mission to give companies control over their brand experience across the entire digital universe of maps, apps, search engines, voice assistance, and other intelligence services that are driving consumer-discovery decision and actions a day, so in practice, that means that a customer of ours like Arby’s manages their brick-and-mortar location information, store hours, menus, other types of information that consumers are looking for on mobile devices and other services insures that that is correct. Not just across the third-party ecosystem, but also across their own website. Jeffrey will speak to what are some of the biggest challenges he sees in B2B marketing and sales from an integrated brand experience and from his own experience working with clients or even as a consumer or a B2B customer himself. Brian asks “What do you see out there and what are some of your ideas and how do you approach that?” Listen in to hear great insights. This entry was posted on June 20, 2018 at 12:43 pm and is filed under Hire Power Radio with tags Guest: Jeffery K. Rohrs. You can follow any responses to this entry through the RSS 2.0 feed. You can leave a response, or trackback from your own site.